In 1976, while finishing up his studies at the St-Hyacinthe technological institute, the eldest son Robert saw a TV show on a raising boars, and the rest is history! He purchased a few specimens, and “La Bauge de Brigham” was born. Over the 25 years that followed, Robert and his wife Monique worked hard to produce and market this delicious meat, which was still relatively unknown in Quebec. 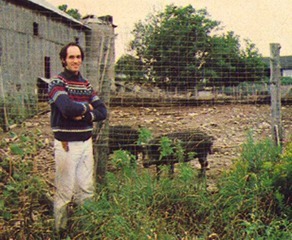 Robert was the first person to import purebred boars from Sweden to Canada to improve the genetic quality of Canadian herds. 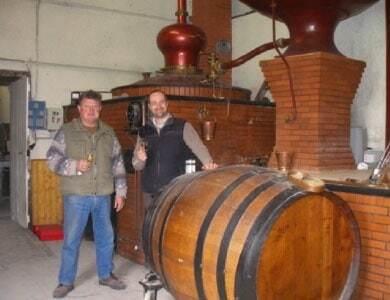 Then, in 1986, after 26 years operating a dairy farm, Alcide and Ghislaine decided to launch into a new adventure: planting a vineyard and making wine. With the help of brothers Alain and Jacques Brault, they planted a first plot of 5,000 Seyval Blanc vines. They then added 1,000 Chancellor vines in 1989. That same year, distinguished sommelier Alain Bélanger took over wine making at the vineyard until 1992, followed by Luc Rolland, an SAQ employee who developed the vineyard’s products from 1992 to 1996. When customers came to taste the first vintage in 1990, they immediately noticed the boars on the property. They were intrigued by this exotic animal, and the brand new vineyard soon became a tourist destination with a unique draw—wine and exotic animals. In 1996, Simon, Alcide and Ghislaine’s youngest son, a rural engineering graduate from the St-Hyacinthe institute of technology, joined the founders, bringing his youth, energy and skill. After his father passed away in 1998, Simon took over the vineyard. 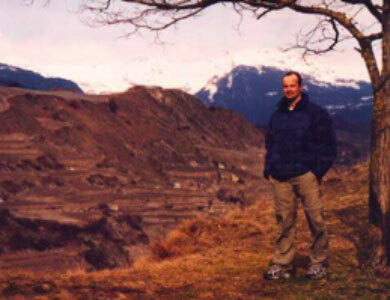 Self-taught and dedicated to research, he worked with wine specialists Alain Brault and Jean-Paul Martin to produce the vineyard’s first vintage of red wine, called “Les Patriarches,” in 1998. It quickly became one of the top wines in Quebec, winning a gold cup at the 1999 Coup des Nations wine competition in Quebec City. 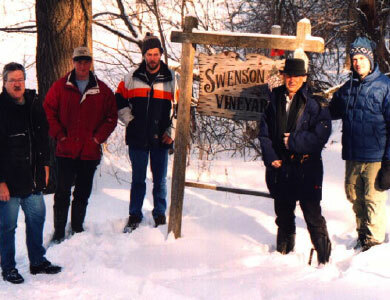 Also in 1999, Simon co-founded a wine-growing research and development club along with three other winegrowers and a nurseryman, which would become the research committee of the Quebec Winegrowers Association (QWA) in 2001. Simon headed this committee for the next seven years. He was appointed to the board of directors of the QWA in 2001 and remains a board member to this day. 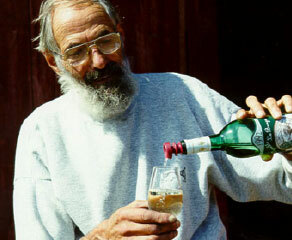 In his role at the QWA, Simon travelled throughout the world’s northern grape-growing regions, including British Columbia, Minnesota, Ontario, Nova Scotia, Germany, Switzerland, Alsace, Languedoc-Roussillon, Côte du Rhône and the Finger Lakes, researching new grape varieties with growing potential in Quebec. His team is credited with introducing a number of varieties into Canada, including the Frontenac, which is now one of the most widely grown in Quebec. 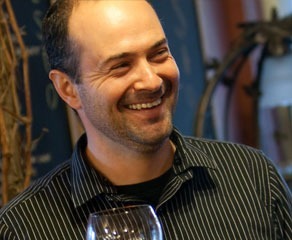 In 2002, Simon was also instrumental in setting up the first wine route in Quebec, in Brome-Missisquoi. Thankfully, this concept took off in various regions of Quebec, each with its unique features, landscapes and local flavour, offering wine lovers the opportunity to discover local products. Today, Simon continues to contribute to the development of the Quebec wine making industry in his role as Senior Vice President of the QWA. He is currently working on eight different wine vintages, which often involves blending various grape varieties to increase depth and complexity, and above all focuses on refinement. 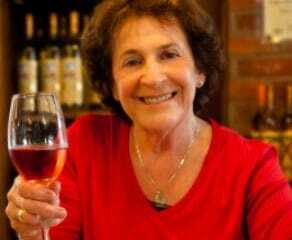 His wines are characterized by delicacy, personality and balance. Today, the vineyard extends across 7.5 hectares. To provide our visitors with a unique and enriching experience, we have also added a number of exotic animals to our original herd of boars.